Quick, cheap and easy ~ can’t beat this simple DIY project! My son used to have a tin piggy bank from the “Cars” movie in his room. We recently “upgraded” (ha! ha!) 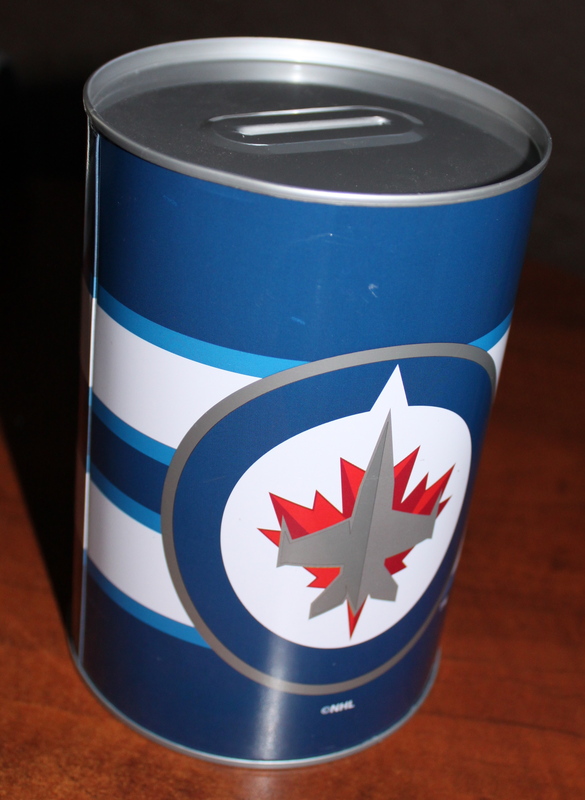 to a Winnipeg Jets one (same tin piggy bank from Dollarama). The great part about these piggy banks is that they can not be opened without a can opener. When we went to transfer Shay’s money to his new piggy bank, he was amazed to learn he had saved $142! On the contrary, my daughter’s piggy bank contains nothing and the little stopper from the bottom sits on the shelf beside her empty bank. We are trying to teach the kids the principle of saving 10% and tithing 10%, but our daughter spends money as fast as she gets it. Unfortunately, the tins don’t fit with her decor at all. 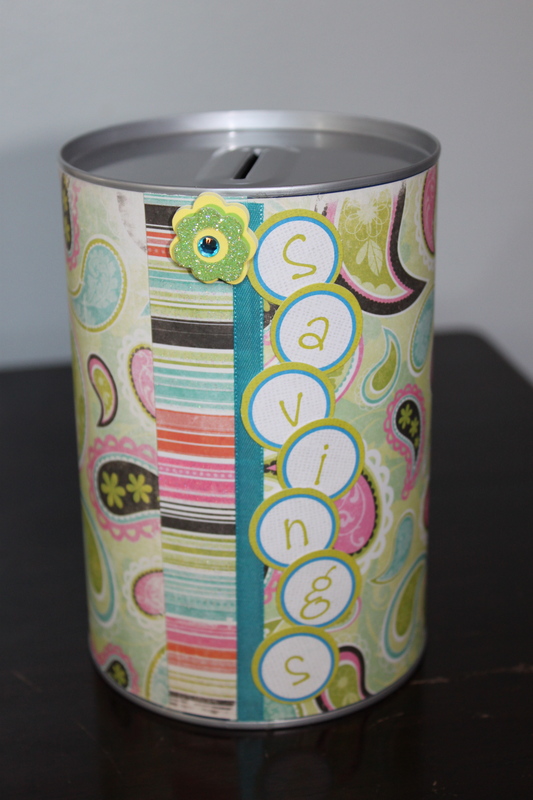 Purchase one of the piggy bank tins from the dollar store. Cut a piece of 12″ X 12″ scrapbooking paper to match the child’s decor. You will need the whole 12″ (plus a bit) to go around the tin and just over 5 1/2″ to cover the entire height. I measured carefully between the two silver lips at the top and bottom of the tin to ensure proper coverage. Secure the paper to the tin a little at a time being careful to place it evenly around the outside, tight up against the lip. I have a tape gun that I use for scrapbooking, but you could use any kind of adhesive to do this. You will notice that there is a small gap where the 12″ length does not quite make it around the tin. Instead of patching, I chose a 1″ strip of coordinating paper and covered the gap with a slight overlap on both sides of the strip, to sit just over the edges of the larger base paper. Embellishments ~ I added a little strip of ribbon, a 3D flower sticker and lettering that I had on hand. All of this is optional, but I found it needed a little something to finish it off. This project took me about 20 minutes to complete from start to finish. The tin was $1.25 and I had all of the other materials on hand. This is a simple Dollarama upgrade that anyone could do and you don’t need any special tools. Have fun designing your own piggy bank to fit your child’s room decor! Posted on August 16, 2013 by Cindy Roy •	This entry was posted in DIY and Upcycling and tagged custom piggy bank, DIY piggy bank, dollar store hacks, piggy bank, piggy bank upcycle. Bookmark the permalink. These banks don’t actually have an opening. They are a sealed can. After a few years, my daughter decided she wanted to access her savings and used a can opener on it. Once opened it’s pretty much done. My son continues to save his change and probably has no idea how much he’s saved!